The Fed likes to report good news. Whether it’s interest rates, unemployment rates, housing start, whatever, it’s never bad news. Even when it’s bad news, the spin will be that everything is under control. The same is true with Ebola. No need to rehash that Obama said Ebola would not hit America’s shores, he has the border PROTECTED! Nor should I mention that he said if Ebola did reach our shores (and it has), it will be contained. So how will Baby Black Jesus keep us safe? By washing Ebola down the drain! 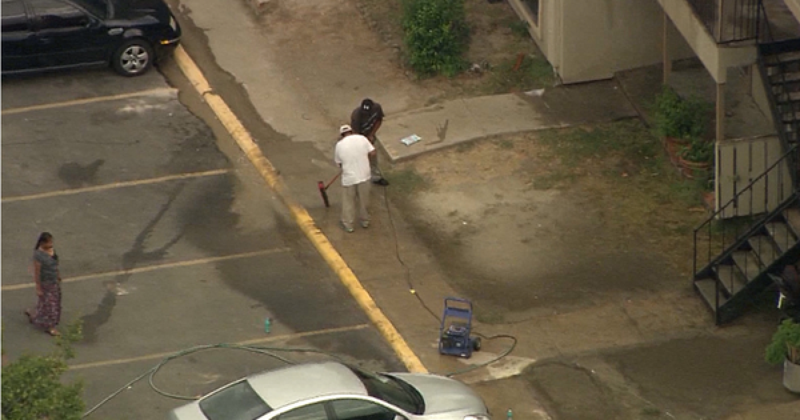 And that is exactly what they did in Dallas; power wash Ebola-laced vomit down the sewer drain. And the guy doing the job has no Hazmat suit on, and you see another potential Ebola carrier in the picture. Like I said, Obama is all over it! I can see the Ebola-ized crocodile terrorizing Dallas as a Hollyweird blockbuster, presuming we survive the apocalypse. I’m questioning the process here, Barack! I don’t know much about infectious disease control, but can’t we put a chemical on it, before we expose it to our sewer creatures? And shouldn’t we quarantine the whole area, and not let Pookie have the gig? Evaluating Obama’s track record, I have ZERO as in “O” confidence that Obama can contain Ebola, hell he can’t even contain Michelle. His sexuality, his real birth certificate, his lackluster grades in college, yes he can cover up that stuff. But Ebola is another story.